The Mangalore Refinery and Petrochemicals Limited (MRPL) has inaugurated its state-of-the-art Company Owned Company Operated (COCO) retail outlet at Panambur, Mangalore. The retail outlet was inaugurated on Tuesday by H Kumar, Managing Director, MRPL in the presence of M Venkatesh, Director (Refinery), AK Sahoo, Director (Finance), Rajeev Kushwaha, CVO and other senior officers and customers. 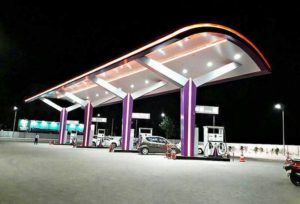 The outlet, which is very near to the New Mangalore Port Trust and is spread across 2.75 acres of land, is one of the largest petrol pumps in Mangalore. It will largely cater to truckers originating from the NMPT port. The petrol pump has a very attractive design and colour scheme which stands out from a distance. The illumination at night is spectacular, giving a new land mark to Mangalore city. This is the third retail outlet set up by MRPL in Mangalore city and the earlier operational outlets are located near its Refinery and at Kadri. MRPL is planning to add other conveniences for the customers at its retail outlets, such as ATM, Dhaba for truckers and Restaurant for motoring public. MRPL also has Cashless Loyalty Scheme at its outlets. This retail outlet is part of MRPL’s Retail expansion plan in the State of Karnataka, Goa and Kerala.